My Recent Purchase: Thinking about getting Guinea Pigs as pets? 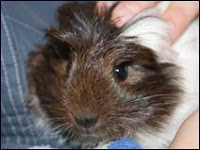 Thinking about getting Guinea Pigs as pets? My own happy childhood was full of pets and I had been feeling guilty that my own kids (6 & 10) were missing out on the experience. One of the main reasons for delay is that my husband has an allergy to fur so our choices were limited. Cats and dogs were a definite no. We had looked after friends hamsters but my husband had noticed the effect that these little guys caused. Our only choice seemed to be outside pet. When our friend's guinea pig gave birth it gave us the perfect opportunity to create an action plan to convince my husband. The kids were desperate and after lots of nagging - he gave in! We only had a choice of two male guinea pigs, I was a little unsure at first, as I was told it was better to get females as they are less likely to fight. However friends have two males and they get on fine. I decided I would rather get two brothers from a family I knew rather than a pet shop with random girls in. We had six weeks to prepare and I insisted the children used this time to find out as much as they could about looking after their soon to be pets. Go to the below address to find out about my experiences buying the hutch, accessories, and how we now care for our new guinea pigs - Malteser & Chocolate Buttons.